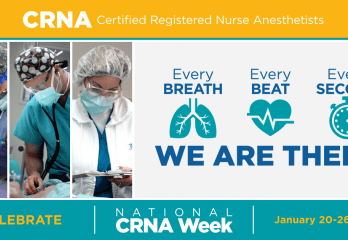 Certified Registered Nurse Anesthetists (CRNAs) are essential to America’s healthcare system, providing high-quality, cost-effective anesthesia care for more than 150 years and safely administering more than 45 million anesthetics to patients each year. A: Statistics show that anesthesia today is safer and more effective than ever before. New technologies and anesthetic drugs, extensive specialty training, and high professional CRNA standards have made the administration of anesthesia one of the safest aspects of a surgical or obstetrical procedure. A: In the majority of cases, anesthesia is administered by a CRNA. CRNAs work with your surgeon, dentist or podiatrist, and may work with an anesthesiologist. CRNAs are advanced practice registered nurses with specialized graduate-level education in anesthesiology. Q: Will a CRNA stay with me throughout my surgery? A: The CRNA stays with you for the entire procedure, constantly monitoring every important function of your body and individually modifying your anesthetic to ensure your maximum safety and comfort. Q: Are there different types of anesthesia? A: There are three basic types of anesthesia: General anesthesia produces a loss of sensation throughout the entire body; Regional anesthesia produces a loss of sensation to a specific region of the body; and Local anesthesia produces a loss of sensation to a small, specific area of the body. Q: What determines which type of anesthesia is best for me? A: The anesthesia chosen for you is based on factors such as your physical condition, the nature of the surgery and your reactions to medications. Q: Do different types of patients require different types of anesthesia? A: Many factors go into determining the best anesthetic and administration technique for each person. Pregnant patients, children, older adults and patients with hereditary disorders such as diabetes or sickle cell anemia all require special consideration. Even lifestyle choices such as tobacco and alcohol use can influence the anesthesia selection process. Q: Why haven’t I heard about CRNAs? Are you a new profession? A: Nurse anesthesia was established in the late 1800s as the first clinical nursing specialty in response to the growing need surgeons had for anesthetists. Nurse anesthetists, pioneers in anesthesia, have been administering anesthesia for more than 150 years and have played a significant role in developing the practice. Q: What is the difference between a CRNA and an anesthesiologist? A: The most substantial difference between CRNAs and anesthesiologists is that prior to anesthesia education, anesthesiologists receive medical education while CRNAs receive nursing education. However, the anesthesia part of the education is very similar for both providers. They are both educated to use the same anesthesia process in the provision of anesthesia and related services. Q: Tell me what to expect when I go for my anesthesia? A: During the procedure, anesthesia allows you to be free of pain. All anesthesia care is provided with the highest degree of professionalism, including constant monitoring of every important bodily function. In addition to nurse anesthetists’ role in the procedure itself, they also make many preparations for the patient before surgery. So it is important that the patient take an active role in these preparations by communicating and cooperating with their nurse anesthetist and surgeon. For example, frank and open discussion with the nurse anesthetist is crucial to selecting the most appropriate anesthetic for the procedure. In particular, the patient must speak freely and follow instructions closely regarding the intake of medications, food, or beverages before anesthesia. Such substances can react negatively with anesthetic drugs and chemicals. Q: Where can consumers get more information about anesthesia? Thank you for such an informative article. It was very helpful. Thank you for the comment Lisa!